These days, we tend to pick the easiest method of obtaining what we want and that’s alright for most people. However, there’s a big difference between guys who bow hunt and the guys that call themselves bow hunters. All you need is a deer tag, a place to hunt and a bow that is sighted in to bow hunt. If you are lucky, you might get a shot. If you are extremely lucky, you might get a kill. That group of folks usually sees bow season as something to do before they get their rifles out and take that 400 yard shot that they paid a hefty price for a guide to find for them. People who bow hunt are typically more interested in the kill than the hunt and have no real interest in the roots and history of this special form of hunting. And that’s alright if that’s how you want to look at it. It’s just not the way true bowhunters envision their passion. I guess I’m being a little prejudiced here, but in all of the years I’ve been hunting, there is nothing compared to the experiences I’ve had while bowhunting. Nothing brings you to the raw, primal essence of hunting like making a kill from close range with one of the oldest methods of hunting known to man. It is beyond words. As you can imagine, I disagree with most people, but there is a method to my madness. Let’s consider both the compound and the traditional bows. There’s a bow and there’s a string. Some are long and some have a recurved design. There’s a handle and a rest for your arrow. You pull the string back with three fingers, let go, and watch your arrow fly—simple, yet somehow familiar. Maybe it’s the old westerns we watched or maybe there’s some ancient memory being stirred deep within our psyche. Whatever it is, it makes us smile and want to shoot it. I don’t know anyone who doesn’t get that same feeling. With it’s system of cables, pulleys and strings running back and forth and all the funky spider web stuff woven into the frame, we are instantly confused and intimidated. What about that circle with the little different colored pins? It looks like it came from another galaxy.Then you get a fancy clip that pulls the string back with a trigger. There is nothing natural about this contraption at all. “But, it is very accurate,” the sales person promises. A traditional bow is meant to be used like it has for tens of thousands of years. 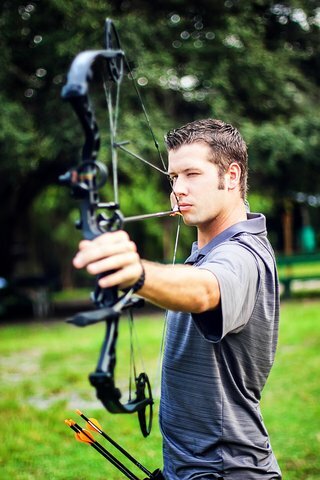 When you shoot a traditional bow you focus on the target instead of the sights you would find with a typical compound bow. The target is the center of your attention and whether it be stationary or moving/flying etc., you shoot at the target. It takes a combination of skill and will to achieve, but it’s like nothing you’ll ever experience. It’s primal and that’s what makes you fall in love with bowhunting. Learning to hunt instinctively will help you in all areas of hunting. It will make you better with your rifle and shotgun too. It is an ancient art that does take a lot of practice to perfect. Learn this type of archery and you will become more accurate with any weapon. It may also help you become more aware and even have more reverence for life when you make a kill. We need more of that these days.